LONDON, UNITED KINGDOM--(Marketwired - July 14, 2016) - Today, The Foundry launches the latest update to its professional look development and lighting tool. Responding to customer demand, KATANA 2.5 will offer support for Windows, putting the award-winning tool in front of more artists working in VFX, broadcast and animation. The new port makes KATANA's full toolset available to Windows-based studios, previously unable to take advantage of the famous "lighting recipes." Additionally, the toolset is easier to install and supports a number of plug-ins including Renderman, V-Ray, Arnold and recently 3Delight. Andy Whitmore, chief product officer at The Foundry said, "The Foundry is constantly striving to help artists be more creative by providing them with the best software solutions in the industry. Launching on Windows and adding support for more industry-standard renderers is a fantastic example of us giving artists more flexibility to work the way they want. "KATANA is a powerful look development and lighting tool that can offer huge benefits to studios of all sizes, so we're thrilled to be announcing its Windows launch. Now even more artists can benefit from the tools that KATANA offers to make their workflows quicker and more efficient." Equally suited to both short and long-form animation and VFX projects, KATANA's unique design was created to help artists conquer a notoriously time-consuming process. 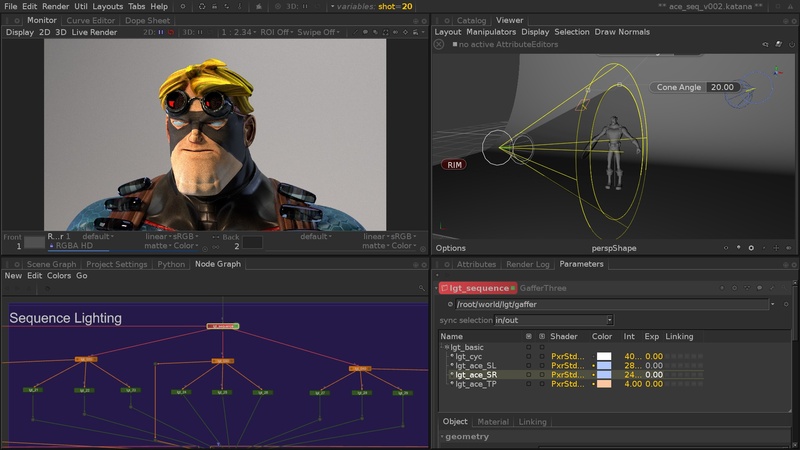 Used in studios from Industrial Light & Magic and Pixar to Atomic Fiction, KATANA allows artists to turn creative lighting setups into "recipes" that can be shared amongst the team, cutting down the time it takes to turn out complicated shots. "KATANA has become the bedrock of our pipeline," said Kevin Baillie, co-founder at Atomic Fiction. "Big scenes, experimental lighting set-ups, we can throw anything at it and it'll give us production-ready results that we can share up and down the chain. With timelines getting shorter and shorter, you need tools like KATANA around; there's no other way to get the work done." KATANA 2.5 is available today as a beta release and will be shipping soon; supported platforms are Linux RHEL Centos 6 and Windows 7 64-bit. To find out more about all of KATANA's features and benefits, visit www.thefoundry.co.uk/products/katana. For information on pricing and how to purchase, or to request a trial as part of the beta program, contact: sales@thefoundry.co.uk. What else is new in KATANA 2.5? Now you can easily select a range of colors or floating-point grayscale values to use as an input to a shader or light with an intuitive, visual UI that offers a more artist-friendly look development experience than in previous versions. The color and float ramp widgets can be used for parameters directly within KATANA, or added to tools in third-party plug-in renderers. It's now possible to add light filters -- such as barn doors, blockers or gobos that stop or reduce the effect of a light for certain parts of the scene -- directly to lights in Gaffer Three nodes, KATANA's default lighting tool. This both streamlines the workflow by allowing you to edit all of your lighting information in a single place, and reduces node graph complexity. Whether you're an artist or a developer, having easy access to the help or documentation you need is crucial. Now, KATANA's user, reference and technical guides have been combined into a single HTML-based, searchable system, while the developer documentation is now presented as an online, searchable developer guide that can be easily and regularly updated. Diagnosing performance issues in complex projects is now easier, thanks to a new mode that enables KATANA to record the time taken by every step when processing a scene. TDs can export and visualize this data in order to help determine the source of the slowdown, and use their findings to optimize the scene. In 2015, the London Stock Exchange named The Foundry one of its "1000 Companies to Inspire Britain."